Almost from ancient times, light has been acknowledged as the transmitter of information to human eyes. Without light hardly anything is known about the "external world". Aristotle ( 384 - 322 BC ) conceived of light as ubiquitous and instantaneous whereas Empedocles of Acragas ( 492 - 432 BC ), Sicilian philosopher-physician-poet and Socrates contemporary, philosophized that the time of transit of light thru an intervening space while bringing information to an observer's eye is finite. in December 7, 1676 and officially published in "Philosophical Transactions of the Royal Society, No. 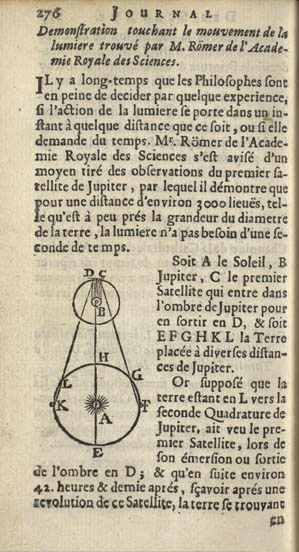 136; June 25, 1677, by Olaf Roëmer". 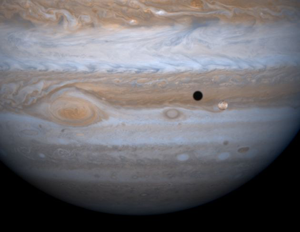 He observed that Jupiter had a transit orbit equivalent to 12 Earth-years and that between an Earth-winter and -summer Jupiter moved slightly [ 1/24th in its total transit orbit ] and hence remained relatively aligned with Earth during any 6 - month period. Further, by observing the satellite motions of Jupiter's Io moon as Io entered and then exited from behind Jupiter's shadow when Earth and Jupiter were closest [ Earth summer position at H, see below ], it took approximately 42 hours and 28.6 minutes or ≈ 42.5 hours. Galileo Galilei on January 7, 1610. These numbers which Roëmer used were of course best estimates and approximations calculated by him over several years. Nevertheless Danish Olaf Roëmer did indeed first demonstrate that , speed of light, is finite and calculable. The modern transit time over 2.0 AUs for Io's reemergence is now accepted as ≈ 16 minutes 40 seconds. Later did James Bradley ( 1693 - 1762 ) so give confirming credit to Olaf Roëmer in his 1729 seminal paper as regards both star aberration and the speed of light. Read: "A Letter giving an Account of a new discovered Motion of the Fix'd Stars", by James Bradley (1693-1762), Royal Society, January 1729 - Phil. Trans. xxxv. 637, to read Bradley's deductive reasoning for the derivation of the star aberration formula, especially pg. 648 of this pdf in his usage of "Sine". Further read Bradley's reference to Olaf Roëmer's determination of the speed of light, page 653 of this historic pdf, a half-century earlier using Io as one of the satellite moons of Jupiter during any 6-month period between Winter and Summer. Empedocles of Acragas ( 492 - 432 BC ) philosophized that is finite. Danish Olaf Roëmer in 1676 is the acknowledged first to have determined . Hippolyte Fizeau in 1849 performed the first successful measurement of using an earthbound apparatus. Polish-born, Jewish American Albert Abraham Michelson together with Edward Morley determined that = 299,792 km/sec (186,265 miles per second) is finite and that no "ether" [ aether ] exists for which he became the first American in 1907 to receive a Nobel Prize in Physics. Modern accepted value for = 299,792,458 m/sec ( 186,292.03 miles per second ), rounded off to = 300,000 km/sec ( 186,000 miles/sec ). 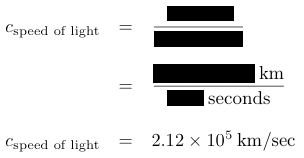 A better expression for the speed of light combining time and space is 1 meter of light travelled in 1/299,792,458 seconds.